Most investors have a deep-seated belief that bonds are a safe investment while gold is risky and volatile. If we explore this belief with an open mind, however, we will find that gold, not bonds, offers vastly superior wealth protection. The 2008 financial crisis saw an unprecedented move out of equities and into bonds as investors looked for a safe haven, one that would protect their portfolios. Relatively few investors chose to move into gold. This is curious because gold, unlike bonds, is an asset class that has a negative correlation to financial assets, thus providing the greatest diversification as well as protection from inflation and currency crises. 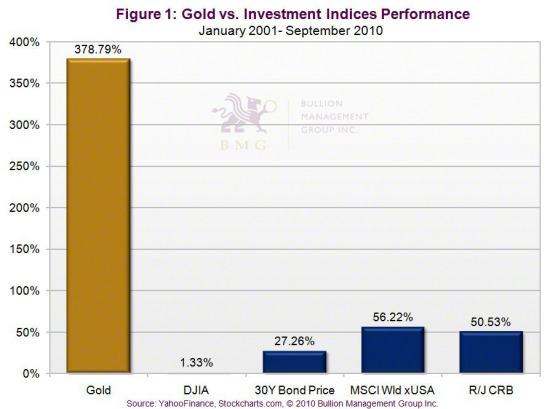 This is illustrated in Figure 1, which shows how gold has outperformed all major asset classes. 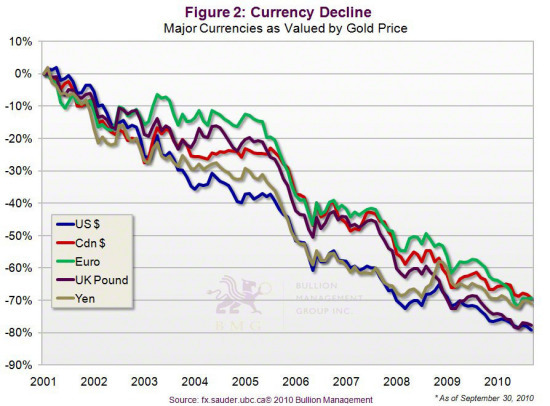 In addition, gold has outperformed all major currencies, as illustrated in Figure 2. The US government’s response to the 2008 financial crisis was to embark on and continue with policies of extreme stimulus and bailout packages. These policies will provide only a temporary reprieve, a Band-Aid solution to America’s dire situation. Since the financial crisis was caused by excess debt, issuing more debt can hardly be the cure. The US Treasury, with help from the Federal Reserve, essentially flooded the economy with excess dollars, driving the money supply to unparalleled levels and inviting the very serious threat of future inflation. Currently, the official Consumer Price Index (CPI) stands at a very modest 2 percent. 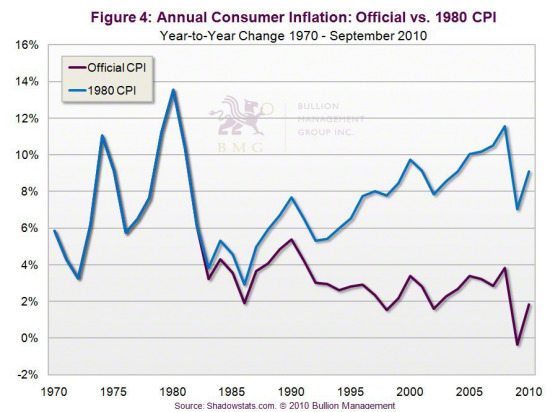 However, the methodology for calculating the CPI was changed in the early 1980s. Instead of using a fixed basket of goods that represented a certain standard of living, today’s methodology uses substitution, hedonic adjustments and geometric weighting to understate the CPI. John Williams of www.shadowstats.com, calculates the CPI using the original methodology, as shown in Figure 4. From this, we can see that real inflation is already at 8.5 percent and is poised to get much worse. The US government is also intervening to keep interest rates artificially low by having the Federal Reserve issue new money with which to purchase US Treasury debt. With interest rates at record lows there is no room to maneuver, except with further quantitative easing, which Fed Chairman Ben Bernanke has already stated he will continue to use. This will only serve to increase the money supply and lead to higher inflation. This policy of aggressive quantitative easing – or, to put it bluntly, money printing – will most certainly devalue the US dollar further, again eroding the real value of bonds and boosting the prices of precious metals prices and other commodities. With interest rates much lower than inflation we can see that, in relative terms, it is bonds that are not providing any returns. With real inflation at 8.5 percent, bonds are not a safe investment; rather, they represent guaranteed annual losses of about 5 percent of purchasing power. At this rate, bond principal will be halved after 14 years. 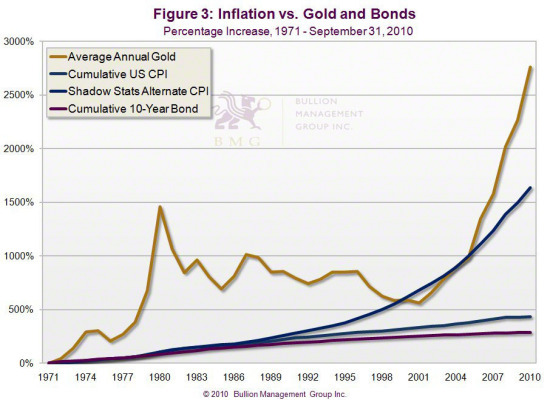 Gold, however, has generated annual compounded rates of return of 16.7 percent. BMG has a comparison chart on its website that compares bond income to a systematic withdrawal of units in BMG BullionFund, taking tax and inflation into account. The chart is customizable to investors’ own situations and/or expectations, and can be found at www.bmgbullion.com/calculator. 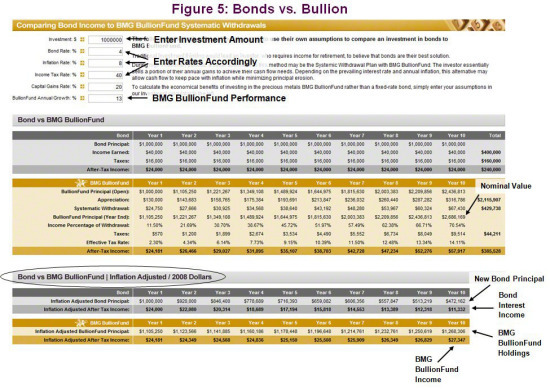 The example in Figure 5 compares bond income to an investment in BMG BullionFund with systematic withdrawals, assuming an investment of $1 million, a 4 percent bond yield, an 8 percent inflation rate and a 13 percent annual appreciation of BMG BullionFund. The BMG bond calculator shows the inflation-adjusted cash flow and the inflation-adjusted principal. In the grey section under the heading “Bond vs. BMG BullionFund/Inflation Adjusted/2008 Dollars”, we can see that the after-tax bond interest income starts at $24,000 and reduces to $11,332 in purchasing power by the tenth year. The bond principal balance reduces from $1 million to $472,162. In the gold section, BMG BullionFund investor has liquidated only part of the annual gain, but still maintained the inflation-adjusted purchasing power of the after–tax cash flow for the entire period. In the “Inflation-Adjusted After-Tax Income” section, we can see that the $24,181 net cash flow was increased to $27,347 in the tenth year. BMG BullionFund nominal value increased to $2,686,169 while the inflation-adjusted value of BMG BullionFund holdings increased to $1,268,306. Bond returns are so minimal at present that it has given rise to the serious question of whether the bond sector is in a bubble and subject to losses if interest rates rise. This is perhaps a separate conversation, although it is common knowledge that feverish, inexplicable buying is the cornerstone of any bubble; with the negligible interest rates on bonds being wiped out by inflation, it is hard to understand the attraction. 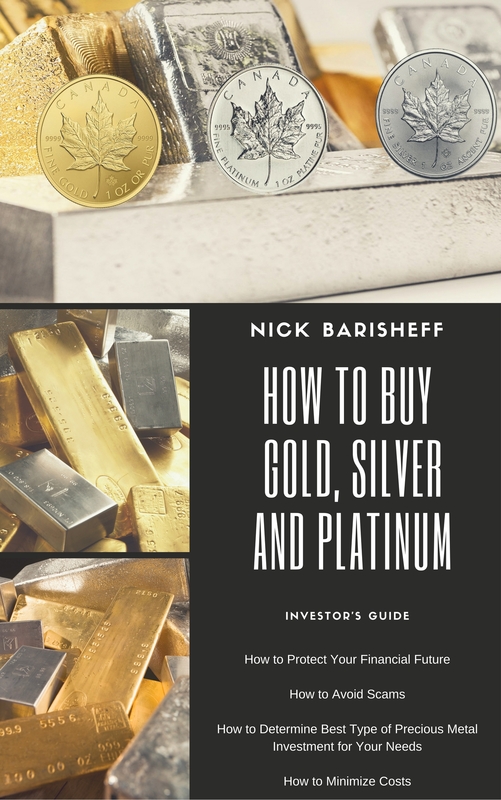 Finally, it is worth noting that bonds, like equities, are a financial instrument, someone else’s liability; a holding of physical gold bullion is not. A bond holder gives up their money and risks a loss of principal for a certain period of time in return for a yield. 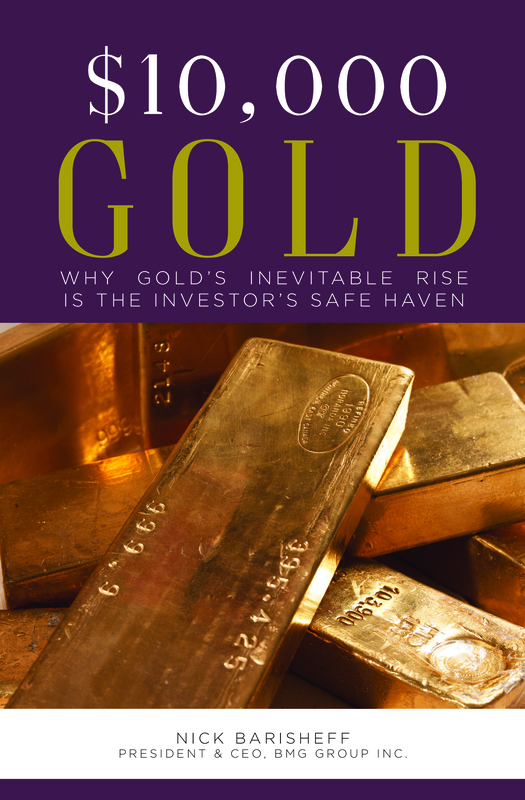 A holder of physical bullion could lease out their gold and generate income, but they seldom choose to do so as it is precisely the safety of preserving wealth in real terms without risk to capital that savvy investors seek in uncertain times. Given the current economic climate and the fiscally irresponsible policies, including competitive currency devaluation, which governments in the US and indeed around the world are implementing, it is no wonder that investors are desperately seeking ways to protect their wealth. As explained above, however, moving from equities into bonds is like jumping from the frying pan into the fire. 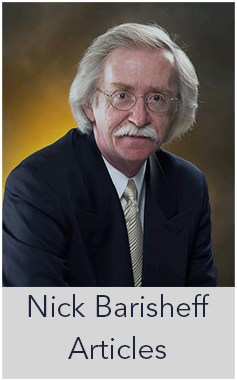 The smart move for wealth preservation is to a physical holding of gold bullion.